You know that feeling you sometimes get that tells you something isn't right? Well, that's your gut telling you to beware. As humans, we tend to rationalize away that feeling. However, trusting your gut is something that can help you make better decisions, earn more money, or sometimes save your life. One of my favorite non-fiction books is The Gift of Fear by Gavin de Becker (click freely, this is NOT an affiliate link). It discusses the power of one's intuition as a means of avoiding violent crime. It's a great read. But, there's lots of other scenarios where we should trust our guts, too. Should we do business with Mr. Smith? Is Ms. Jones someone who can be trusted with our large financial investment? Will Mr. Applebee deliver the project to the big client on time? Trusting that feeling deep inside ourselves is something we should all do more. For example, I'm a big-time animal lover. Whenever someone passes me with their dog, I say "hi" and ask to pet him or her (the pup, not the person). I love pooches. Except, that is, the brown and white dog that I pass in my neighborhood sometimes. This dog always makes me uneasy; he seems unpredictable. And, although I feel like I'm offending the dog's owner, I stay clear when I see the dog approaching. Today, I learned that the dog bit someone in an unprovoked attack and had to be put to sleep. I feel sorry for the dog and the owner, but I'm glad I trusted my gut and kept my distance. That could have been me on the receiving end of that bite. The next time you have a decision to make, listen to your gut. Don't rationalize away warning signs. Don't be so optimistic that you don't see the reality of the situation. Trust your gut. It should be your business partner, your accountant, your counselor, and your most trusted friend. Have a story to share where you trusted your gut and avoided a bad situation? How about a time when you ignored your gut and found yourself in a world of hurt? Hi Amber! I am a firm believer in gut listening. That is not to say that I don't override my gut and make bad decisions...I do. I find that happens most often when the atmosphere is frenzied...when there is electricity in the air that seems to supersede my ability to think rationally. But, when I can escape from the "chatter" inside and out, I am better able to hear what my gut is telling me. I love your story about the dog (sad story) because it exemplifies exactly the unique power of the gut...that the gut message is most often based on NOTHING...nothing but that GUT. That is SO amazing. That if we take the time to quiet the distractions, we can actually "feel" if something is right or wrong based on no external evidence...so powerful. One morning I was going to have cereal for breakfast. I looked at the milk carton and it boldly proclaimed the expiration date was two days away. Being the cautious one however, I decided to put it to the smell test anyway. Hmmmm, my head said you still have two days to go; but my gut said something entirely different like 'this might be a bad thing if you decided to power through this bowl of cereal'. I decided to trust my gut that morning...........:). Your gut is usually right BTW. Thanks for adding to the discussion! You rock! Oh, and my gut tells me good things about YOU, too! Ha ha. Good story. ALWAYS trust your gut when it comes to food! As for the dogs you babysat, you may be a little lucky on that one. The woman really should have had you come visit inside the house to say hi to the dogs when she was there before you went in alone. Glad it went ok, though. Dogs are so much like people, though. They give you the signs and everything you need to know. We just need to listen more. Your right, Bill. 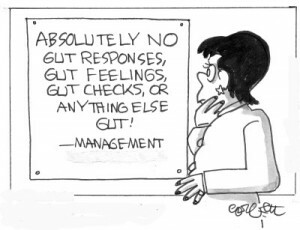 The gut is usually spot on! Great story, Erin. You're so right. We all do things that we know aren't right for us because our "rational mind" says we should. It's hard to have faith and trust our gut sometimes. But, at the end of the day, our gut has our back. Always. Really though, I rely on it 100% even at my color consultations. It's really a guardian angel!